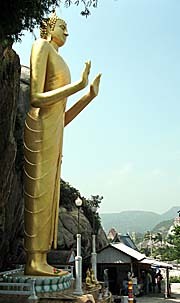 A few kilometers south of town the Hua Hin beach ends at a Khao Takiab Mountain (272m). As so often on the peaks is a buddhist wat placed. Here it's a Thai/Chinese temple with a large standing Buddha statue as a landmark. Macaques live on the hill. The image top right shows a locust on a car in Hua Hin downtown. 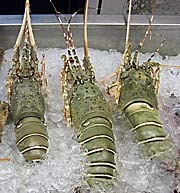 Hua Hin is Thailand's most famous sea resort. 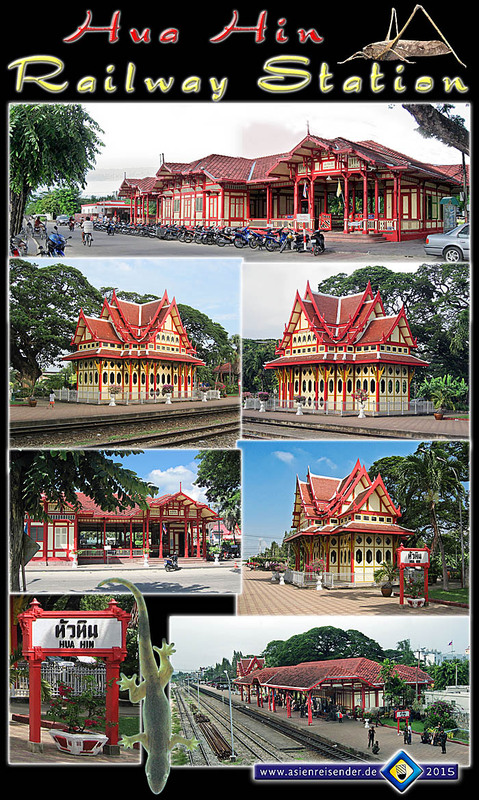 It became favoured with the establishment of the railway line from Bangkok to the south in 1921. Nowadays Hua Hin is one of the very touristic places in Thailand with many hotels (many very big) and guesthouses of all classes, restaurants from all over the world, entertainment for the mass taste and a not too small redlight district with the notorious girl bars. Many Westerners live here as pensioners. Hua Hin lies about 190km south of Bangkok at the Gulf of Thailand. 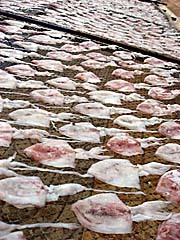 It is part of Prachuap Khiri Khan Province. The old town of Hua Hin is still coined by the old teak shophouses. 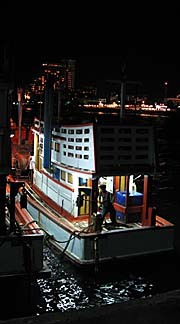 Now most of them serve as guesthouses or restaurants. Others got demolished and are replaced by new concrete buildings. Bordering the old city is the commercial district with all the bustling business. 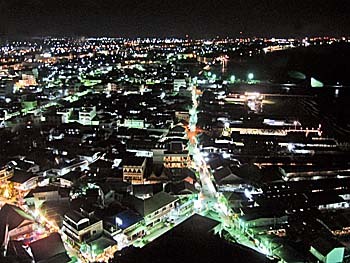 Hua Hin is connected to Bangkok by the Phetkasem Road 4. The road leads down to the very south of Thailand and continues in Malaysia downwards the whole Malay Peninsula until Singapore. The railroad connection runs widely parallel to the road. One of the most remarkable buildings in town is the beautiful railway station (see below). It's a white-red coloured wooden building which has a royal pavilion a few meters north of the main building. The Thai royal family has a summer palace a bit north of town since 1926. The palace is called 'Wang Klai Kangwon', what is translatable to 'palace far away from worries'. So, in the beginning, Hua Hin was a place to go for the Thai nobility. King Bhumibol Adulyadej spent much time here, particularly in the years 2004 - 2006. The Railway Hotel close to the beach was a residence for the royals in the past; it still serves as a hotel. The Railway Hotel, by the way, served as 'Hotel Phnom Penh' in the film 'The Killing Fields'. The place is, due to the mass tourism, pretty crowded, and the beach, who is 4km to 6km long, is filled with sunbathers, swimmers, families, playing kids, pony riders, kite sportsmen and many more. Golf is getting more and more popular here; Thailand generally is a recommended address for golf players. The price level is higher than elsewhere, as it is usual in tourist places. Besides Westerners (many of them quite wealthy) are many Thai tourists here (often from Bangkok) and more and more tourists from other Asian countries visit the place. 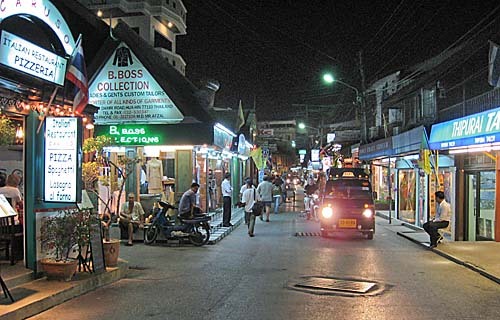 Due to all the influences and the fact that Hua Hin is a rich place, it has a cosmopolitan flair. A lot of festivals and spectacles happen here.